Unless you are living under the rock or don't give a dime about skincare, you might be aware of the new The Body Shop Super Food Face Masks. There are five variants in total, and I saw them first last year in Malaysia. Luckily, right before the summer's humidity damages our skin, we have the masks in India. Each of them is inspired by traditional beauty remedies from all over the world - this is the part which excited me the most. Each of the masks has different texture, ingredients, and fragrance to reveal skin's healthy looking glow. Super excited!! But, there is a but here. The masks are pretty expensive. I uploaded an image of the textures of these masks on my Instagram feed. When I asked what they feel about it and everyone used the word 'expensive' in some or other way. How expensive? Rs 2495 for one tub. The price in the USA is $28 which comes to around Rs 1850. Interestingly, the price was around that even in Malaysia. 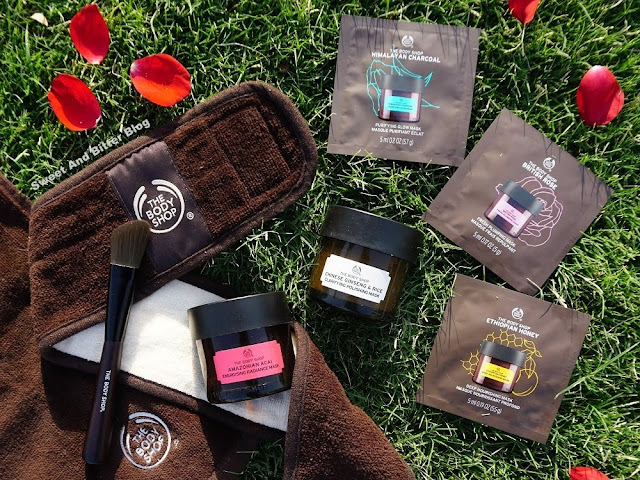 If you buy from the online store of The Body Shop India, the price comes close to the USA price because of the 25% discount. Later I even got to know that people got 40% off in the USA. So, overall I am confused why the price is high in the first place. Which ones did I get to try? All of them. I had three in my mind - Chinese Ginseng and Rice, Himalayan Charcoal, and Amazonian Acai Berry. 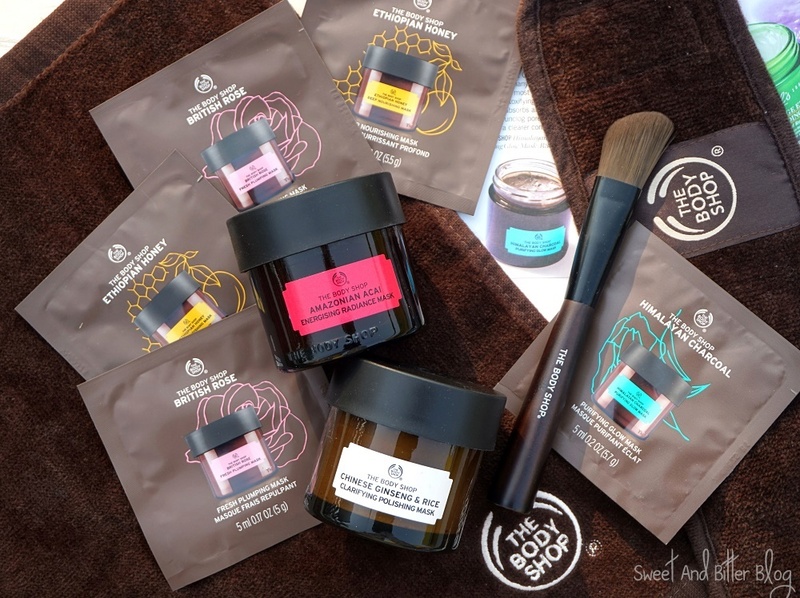 The Body Shop offered me 2 of their masks to try. The SA at the store convinced me that the Acai Berry recharges and jump starts your skin to start looking healthy. So, I picked Acai Berry instead of Himalayan Charcoal because I have never tried any products with Acai Berry whereas I have tried many with charcoal. Luckily, I also got multiple samples for the rest of the three masks. Yippee. Himalayan Charcoal Purifying Glow Mask: You must be wondering how charcoal is food. Well, some do take charcoal tablets it to remove toxins from the body. Also, it has green tea leaves. The leaves are chunkier bigger pieces, but they do not sting/burn/poke (which most masks with chunky neem leaves do). The mask is not black as I had expected. The green tea gives it a relaxing fragrance which has the power to induce calm and even sleep. The aroma is just like the Fuji Green Tea range. #Bliss It is tough to wash off so, do not let is dry of a long time. I found no visible effect on acne. Maybe prolonged use will show benefit. Ethiopian Honey Deep Nourishing Mask: I had no interest it this because - can't I just use honey? Directly? When I touched it, I started to detest it. The texture is not like honey but different. It is supposed to replenish hydration and boost elasticity. My question here - why will I buy this and not pure organic honey? Why will I use a mask for moisturizing which has to be washed off and not a sleeping mask or sheet mask? Why won't I use a natural oil to add and seal in the moisture? But, when I used it, I realized that the texture is what that makes it better. 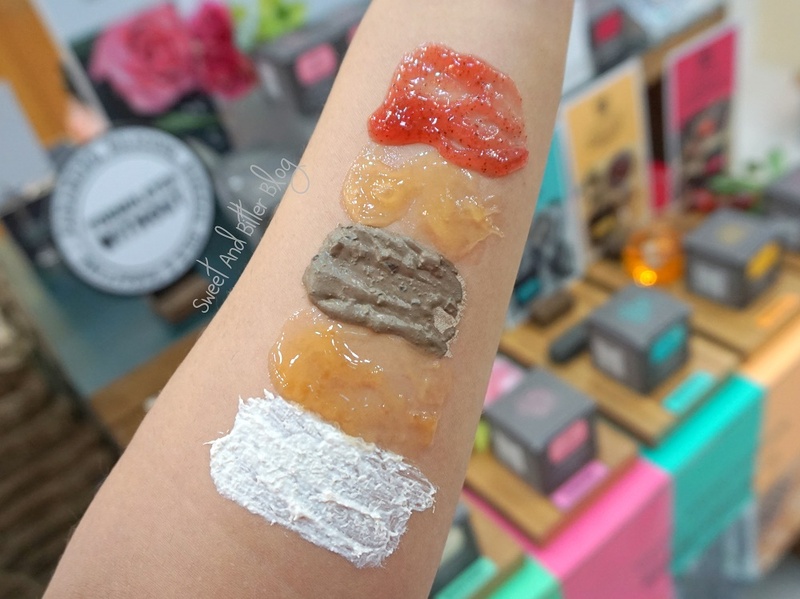 The sticky texture is almost like a sleeping mask when used on the face. Being gel based/oily, it does not dries down completely. So, it stays one without irritating or feeling sticky and keep on sealing the moisture in. It is easier to apply and remove than real honey. I will recommend this to anyone with dry skin. 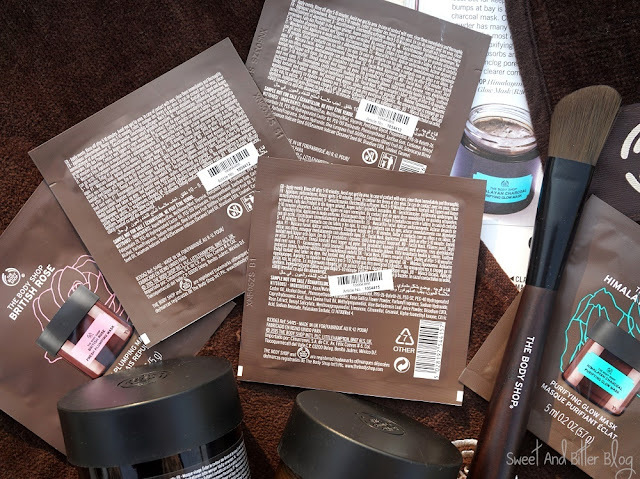 Amazonian Acai Energizing Radiance Mask: A very light scrub which was suggested by the SA. The base like most of The Body Shop body scrubs of the berry types. There are small granules of in gel and looks like a lush fruit jam. It does mild exfoliations and boosts nutrients. It does not dry skin at all. It should also work for sensitive skin, and the granules are soft. Good that I got the tub of this. British Rose Fresh Plumping Mask: Gel with bits of real rose petals. It is more watery and less oily that the Ethiopian Honey. This also provides and seals in the skin, and slowly the product gets soaked up the skin. Another great mask for dry skin. Chinese Ginseng and Rice Clarifying Polishing Mask: I had very high hopes from this, and to a large degree it delivered as well. The mask exfoliates and polishes skin without being harsh. Bonus: Great fragrance. While I appreciated the Charcoal one the most, I enjoyed the rest this week the most. Last week, Nagpur heat 'gifted' me dry, flaky, peeling skin. Amazonian Acai Energizing Radiance Mask helped soften the dry flaky skin and Chinese Ginseng and Rise scrubbed off the peeling skin. 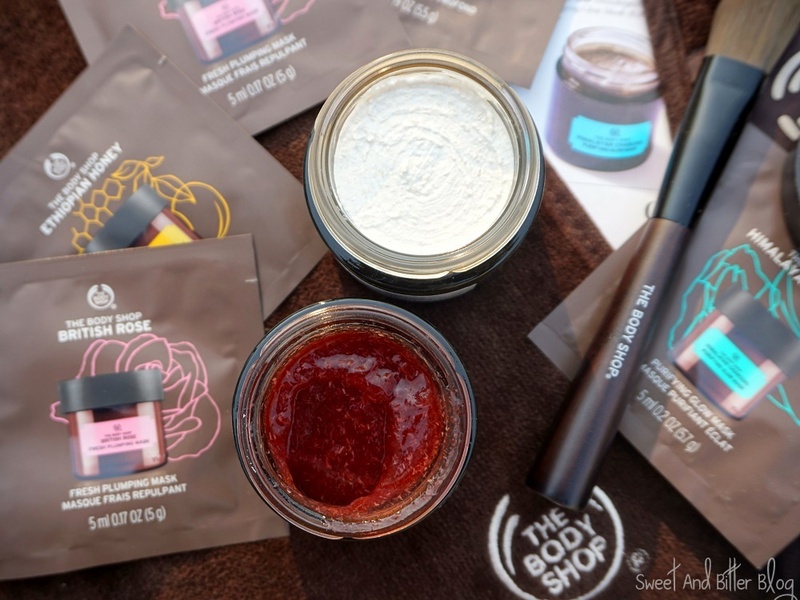 The British Rose and Ethiopian Honey helped nourish the new skin without any tingling sensation. I also started using Kama Kumkumadi from last two days and luckily, I am skin is lot better than what you saw on Instagram. Thanks for the tips. It helped me a lot. Overall: This is one the good launch from The Body Shop with ingredients not just for fragrance but to act on skin. There is something for everyone. Himalayan Charcoal is perfect for humid summer, Ethiopian Honey for dry flakes and soothing skin, Amazonian Acai to gently exfoliate, Rose Fresh to add moisture, and Chinese Ginseng and Rice for gentle yet effective cleansing and exfoliation. Each of the face masks is good. But, the main question here is - Is it worth the huge price tag? They are great, but I won't recommend buying them at full price.